A few weeks ago I reviewed “A Seraphic Fire Christmas”, a Grammy nominated recording from last year (CD and iTunes) from by the Miami-based professional choir led by Patrick Quigley. Today I will give you a mini-review of their brand new Christmas recording, “Silent Night”. It's not too late to get this in time to listen to for this Christmas, especially if you use the iTunes download option. The singing on this recording is resonant and full, the intonation impeccable and the sound recording superb. Seraphic Fire has set the bar high for themselves with each recording, and this one is no exception. It is especially rewarding to hear them match their singing to the personality of each piece- quite evident in the most dramatic, passionate piece, Steven Sametz' setting of the Spanish text Niño de Rosas, with a robust solo by Lexa Farrell. Because Quigley's professional singers are so adept in so many vocal styles, he can sculpt the sound of each piece to his precise liking. There are some tracks here that alone justify purchase of the CD. A striking performance of an old chestnut, Victoria's “O Magnum Mysterium” is sheer perfection, magically balancing both linear and horizontal axes of the late Renaissance counterpoint. Likewise, the sheer beauty of tone and tuning of modern American harmonies in Stephen Paulus' little gem “Hymn to the Eternal Flame” is magical. Gitanjali Mathur's soaring, glorious descant on the final verse brings chills to the spine. While there are a number of songs which may be unfamiliar to the average listener, there are still plenty of standards to satisfy those who want to hear new recordings of music they are already familiar with. Among these the standouts are performances of John Rutter's arrangement of “I Wonder as I Wander”, the Wilhousky arrangement of “Carol of the Bells”, and Quigley's own arrangement of “Silent Night”. Seraphic Fire just keeps getting better and better as they enter their second decade. Patrick Quigley continues his tradition of letting the music speak without overreaching or getting in the way. His magic is in finding just the right sound and approach to each piece the ensemble presents. Bravo, Seraphic Fire! Patrick Dupré Quigley is the Founder and Artistic Director of Seraphic Fire and the Firebird Chamber Orchestra, has been described by the Miami Herald as, “a musician with a constellation of qualities rarely found in a single conductor: an enthusiastic and audience-friend personal style, a scholar’s instinct for rooting out obscure but worthy music, a scrupulous and historically informed approach to works that span a wide range of musical periods, an ability to bring out the best in his talented platoon…and a showman’s canny sense of how to appeal to audiences"
This past year, Mr. Quigley was nominated for two 2012 Grammy awards for his work with Seraphic Fire and the Professional Choral Institute: Best Choral Performance for Brahms: Ein Deutsches Requiem, and Best Small Ensemble Performance for A Seraphic Fire Christmas. Seraphic Fire was the only chorus in North and South America to be nominated for a 2012 Grammy award, and Quigley was the only conductor to be nominated for two separate recording projects. Under his direction, Seraphic Fire has released ten recordings on the Seraphic Fire Media label, with three additional recordings forthcoming this year. 2012 sees Mr. Quigley making guest appearances with the San Francisco Symphony’s Community of Music Makers series, Cincinnati’s professional Vocal Arts Ensemble, and two separate appearances with the San Antonio Symphony. With Seraphic Fire, Patrick will conduct over 65 performances across the United States. Quigley is the recipient of the 2004 Robert Shaw Conducting Fellowship, given annually by the National Endowment for the Arts and Chorus America to one conductor between the ages of 25 and 40 who demonstrates the potential for a significant professional career. At 26, Mr. Quigley was the youngest person to receive this award. Most recently, Mr. Quigley was awarded Chorus America’s 2011 Louis Botto Award for Innovative Action and Entrepreneurial Zeal, recognizing his artistic and institution-building achievements with Seraphic Fire. Patrick received his M.Mus in conducting from the Yale School of Music and his B.A. in musicology from the University of Notre Dame, and is a graduate of the Indiana University Center on Philanthropy’s Fundraising School. Entering its second decade, Seraphic Fire has become one of South Florida’s most important performing arts organizations and has a national reputation for choral music excellence. Led by Founder and Artistic Director Patrick Dupré Quigley, Seraphic Fire brings the best ensemble singers from around the country to South Florida to perform repertoire ranging from Gregorian chant to newly commissioned works. This past year, the ensemble’s recordings Brahms: Ein Deutsches Requiem and A Seraphic Fire Christmas were nominated for two 2012 GRAMMY awards. Seraphic Fire was the only choir in North or South America to be nominated, and the only classical ensemble in the world to be nominated for two separate projects. In addition to a critically-acclaimed chamber choir, the organization has established Firebird Chamber Orchestra, which collaborates with Seraphic Fire on choral-orchestral masterworks as well as independent concerts of orchestral repertoire. The orchestra, like the chorus, is made up of top-tier performers from around the country who fly into Miami for intensive periods of rehearsal and performance. Seraphic Fire is also committed to educational outreach: the Miami Choral Academy, Seraphic Fire’s inner-city education initiative, aims to change lives of underprivileged children by offering daily afterschool choral music instruction at disadvantaged Miami-Dade County public elementary schools. The program currently serves 200 children in five after school choirs. Additionally, Seraphic Fire has established the annual two-week Professional Choral Institute & Artistic Director Academy which trains aspiring pre-professional singers and conductors with the aim of giving them the musical and business skills to make professional choral and ensemble singing their full-time vocation. The Professional Choral Institute is the only such program in the United States. Would I like to own the Lanza Family's Guns? Yes, this is usually a blog about the choral music world, but sometimes it isn't. A few people have told me to keep politics out of this part of my life and this blog, but, sorry-- no can do, no please you. And in fact, this ISN'T political- it's about life and how some people's lives end in an evil instant when bullets-- many, many bullets, enter their body. A girl who jumped out of a closet and shouted, "Boo!" when her parents came home in the middle of the night was shot and killed by her own father. Fourteen-year-old Matilda Kaye Crabtree's last words to her father were "I love you, Daddy." No charges were brought against her father, 53-year-old Robert Crabtree. The Ouachita Parish Chief Deputy, Richard Fewell, said the case would be turned over to the District Attorney as a matter of routine. "It's sad," Mr. Fewell said. "This is something every kid has done. I don't know how the father is going to live with it." Matilda and a friend, whose identity was not disclosed, were supposed to be spending Saturday night at the friend's home but had decided to go to the Crabtrees' while Matilda's parents were away, Mr. Fewell said. When Matilda heard her parents drive up around 1 A.M. Sunday, she and her friend came up with a practical joke: They hid in her bedroom closet and made noises to make her parents think someone had broken in, Mr. Fewell said. A Centurion man accidentally shot dead his young daughter on Friday morning when their house was broken into, Gauteng police said. Lt-Col Lungelo Dlamini said the man was awoken by a commotion at his house on Glover Street. "He went upstairs to fetch his firearm and while he was there, he heard the commotion again near the door. He fired a shot which hit and injured his... daughter," said Dlamini. "She was taken to hospital in a critical condition, where she died. We have opened a case of culpable homicide." Dlamini said the five robbers fled the premise with a handbag, which belonged to the man's wife. No arrests had been made. Beeld newspaper reported that the father had heard dogs bark, went downstairs to investigate and spotted a robber in the house, in the early hours of Friday morning. He ran back up to his bedroom, slammed the door and took his firearm from the safe. At that stage, his seven-year-old daughter had woken up and wanted to go into her parents' bedroom. When she turned the door knob, her father thought it was one of the intruders and fired a shot. He opened the door and found her lying there. According to Beeld she had been shot in the head. An official with knowledge of the investigation tells The Associated Press three weapons were found inside Sandy Hook Elementary School and a fourth weapon was found outside. These weapons are critical evidence as investigators try to unravel why Adam Lanza killed 20 children and six school workers Friday after killing his mother at their home. The official was not authorized to speak on the ongoing investigation and spoke only on condition of anonymity. _ Bushmaster .223-caliber: lightweight with a high capacity, it also is popular with law enforcement and the military, and is commonly seen at shooting competitions. Two men convicted in a series of sniper killings in the Washington, D.C.-area in 2002 used a Bushmaster .223-caliber rifle that they fired from the trunk of a car at randomly picked victims. Some models have a detachable magazine that can hold up to 30 rounds. The medical examiner in Connecticut said it appeared all the children and school staff were shot with the same high-powered rifle, some repeatedly, some at close range. _ Glock 10 mm: a larger and more powerful weapon than the widely popular 9 mm, it is in many respects similar to the 9 mm. It is a lightweight and comparatively affordable weapon that is often used for target shooting and for personal protection. _ Sig Sauer 9 mm: considered an upper-tier, quality product, it's comparatively expensive, and its range of uses include elite military and police units. The Bushmaster and two other weapons were found near the body of Lanza, who killed himself at the school. So perhaps we don't yet have final, official confirmation of what guns were on the scene and what Adam Lanza exactly did with those guns, but I decided to look up these weapons and see if they might be appropriate for me to own to shoot deer or squirrels, and have in my home with my nine year old boy in case of an intruder or rabid bear or alien invasion. Bushmaster military carbines and rifles are helping defend freedom around the world. Proven in the most severe conditions, rugged and reliable Bushmasters are lightweight, accurate, and easy to shoot and maintain. So whether duty calls you to the jungle or the desert... to mountain snows or urban landscapes... highly adaptable Bushmaster weapon systems are battle tested and field ready. With a Bushmaster for security and home defense, you can sleep tight knowing that your loved ones are protected. Bushmaster offers everything you need to ensure the safety of you and your family. Our high-quality pistols, carbines, and rifles are extremely reliable, easy to shoot, and include lightweight carbon models that are perfect for women. And with their intimidating looks, all Bushmasters make a serious impression. Any gun will make an intruder think. A Bushmaster will make them think twice. [Your prankster daughter will even think three times before she pranks you again]. Accuracy and reliability? Whether your prey is a prairie dog at 600 yards or a charging hog that's lost his sense of humor, [or a roomful of small children] you can rely on your Bushmaster for both pinpoint accuracy and quick follow-up shots. From my research I have found that this is a military rifle known as an AR-15 and that today the AR-15 and its variations are manufactured by many companies and are popular among civilian shooters and law enforcement forces around the world due to their modularity and notoriety in being associated with US military. In other words, if you want to feel cool and all Rambo military-like, buy this gun, get your sunglasses and fatigues on, and nobody will mess with you. You won't just be able to kill Bambi with it, you can kill all the animals in the forest with one big sweep. Fully modified Ar15's are capable of firing 800 rounds per minute! This also makes me realize that Adam Lanza could have killed EVERYONE in that school that day if many of the teachers had not been so heroic and able to get so many children out of harm's way. God bless them. I don't want this gun in my house. I don't want this gun in my neighbor's house. I don't want anyone to have this gun unless they are a SWAT team member or a member of the military. PERIOD. Although it was selected by the FBI for use in the field following the 1986 FBI Miami Shootout, their training unit eventually "concluded that its recoil was excessive in terms of training for average agent/police officer competency of use and qualification", the pistols that chambered it were too large for some small-handed individuals. These issues led to the creation and eventual adoption of a shortened version of the 10mm that would evolve into what is today the .40 S & W.
So this is a gun rejected by the FBI for various safety and practicality reasons. Why does it still exist? It mostly seems to be another thrill machine (for people who get off on gun thrills) to own. For some reasons, this gun is still used by some law enforcement agencies, and is often touted as a "hunting gun". Yeah, right. Rumors of the death of the 10mm pistol cartridge and its replacement by the .40 S&W are premature. The talented Ten has simply moved out of town. When you get out beyond the limits of the city, a .38 or 9mm in your holster seems awfully small. As the most likely theater for a potential armed confrontation opens up from city sidewalk, to high speed freeway, to lonely country road and wide open spaces, even the capabilities of a .40 or .45 may be stretched. When the threat of danger lurks, not in the aching veins of some desperate junkie or the evil eye of an adolescent asphalt-jungle predator, but in the paranoia of a gang of land-grabbing marijuana farmers or the stamping feet of a belligerent range bull – out where the bad guy is more likely to be armed with an AK-47 than a pipsqueak pocket rocket, might even weigh a thousand pounds and wear a set of horns suitable for impaling and tossing your big new truck – you cannot be overgunned. If you carry a revolver, this is .357, .41 and .44 Magnum country. If you carry a semi-automatic pistol, this is the land of the 10mm. This is another gun chiefly used by military around the world. It is used by the Navy Seals, but I think their intent is to use it to kill bad people, not seals. OBVIOUS CONCLUSION: NONE of these firearms were truly meant to be in the hands of everyday citizens. They, and the devastating bullets they fire rapidly, were designed for military and law enforcement use. But companies like profits and they are happy to take your money if you need these guns to make yourself happy (see below). Anyone who clears a background check can own these weapons of mass destruction. And you can buy them at many gun shows without much hassle. Why did Nancy Lanza need these military guns? Why on earth would she let Adam have continued access to them considering what we seem to know now (and what she had to have known to some extent) about his mental instability or at least his outsider personality traits. Her role in this comes into question just as much as her son's, at least in my opinion.This was a disaster that did not have to happen. And yet little children, their teachers, and the whole community of Sandy Hook is paying a price which cannot be fathomed. Shame on us, as a country, if we let Sandy Hook and other recent killings happen, and NOT do something to prevent them in the future. Please contact the White House, your senators and representatives and tell them how you feel about this gun and mental health issue. Now ten years old, the Miami-based professional choral ensemble Seraphic Fire, under the leadership of Patrick Quigley, has become a major choral force in the choral world, not just in the US but globally. Singing a wide-ranging, highly creative repertoire, producing Grammy-nominated CDs, becoming involved in a big way in musical education in the community- Seraphic Fire is doing it all! This month they have released their second CD/iTunes release of Christmas music. Here is the info on that recording which, in just a few days of release, is scaling toward the top of the classical release list. But before this CD there was another one which I have been meaning to review for quite awhile now. I finally got around to starting on that review when I realized they were about to release another Christmas CD. So, with apologies to Patrick Quigley for my tardiness, here is the review of the earlier, quite wonderful CD. I hope to review the newest CD soon, and am also going to review their other Grammy-nominated release from last year- the Brahms' Requiem in the piano 4 hands version. For those of you looking to add a quality new Christmas recording to your collection, let me suggest the Grammy nominated “A Seraphic Fire Christmas”, by the Miami-based group Seraphic Fire, released about a year ago. Patrick Quigley, Seraphic Fire’s young and highly talented director, was kind enough to mail me a copy a number of months ago. He also mailed me their recording of the Brahms’ Requiem, which I will review soon as well. Quigley’s repertoire choices for the Christmas CD are brilliant and the whole forms a wonderful progression/arc as the disc plays out. Tracks one through seven take us back in time to the world of chant and chant-influenced music. From this simple, yet elegant beginning, the rest of the CD journey unfolds delightfully. After establishing the homophonic plainchant mode on tracks one and two, Seraphic Fire’s clarity and graceful delineation of free polyphonic line radiate on track three- Durufle’s “Tota Pulchra es Maria”. Another treat here in the first seven tracks is the original Latin chant of “Adeste Fideles” paired with “O Come, All Ye Faithful”. We recognize the Adestes chant as the source of “O come, All Ye Faithful”- but we also hear how the more, to us, familiar “O, come” melody differs here and here from the original Latin tune. This pairing by Quigley is artistically informing and appreciated by those interested in origins and influences. At track eight we take a detour for Morten Lauridsen’s much-beloved “O Magnum Mysterium”, and Quigley changes the tone color to a more modern one here; there is far more warmth and atmospheric modernity in the sound than in the earlier tracks, which are remarkable in their resonance, but sparing in their use of obvious vibrato. Quigley has made strong decisions on the soundworld of this choir for this CD, especially in regard to the model he wants for the older music on the recording. His model, I believe, is wonderful- there is especially a nice ringing through “the mask” in the men’s voices. The women’s voices, in the earlier era music, somewhat suggest the English cathedral boy soprano pure headtone- yet they are obviously artistic, musically sophisticated women’s voices- not boy choristers. As the CD progresses, the repertoire generally becomes more modern, and the singing more 20th-21st century in approach. This of course is the most obvious on the final selection, (We Wish You a) “Merry Christmas”, where the singers pull out all the stops and have a rip-roaring time with this jolly arrangement. Backtracking to two other earlier selections, I have two big favorites. Track 12 is Praetorius’ “Es ist ein Ros”. I love the fact that Quigley tacks on the canon of this piece by Melchior Vulpius which was created a few years after Praetorius’ original. The shift from the homophonic tune to the canon is delicious. The other drop-dead gorgeous track is Seraphic Fire’s’take on living English composer John Tavener’s “The Lamb”, one of my most favorite small Christmas repertoire gems. Quigley understands that all he and the singers need to do is create in sound, with their utmost artistry and vocal skill, what is on the page. Tavener’s melding of text with a haunting melody of odd intervallic turns in two-part voicings is magical and sparingly simple in the best meaning of that term- there is no need at all for any choir to try too hard to make it more than it what was meant to be. Hearing this, and many other tracks here, one is amazed by Quigley’s musical maturity and artistry- he is still a very young man with much greatness ahead of him and for his ensemble. Seraphic Fire is one of the very few premier, fully-professional choral ensembles in the country. Let us hope that they continue to succeed season after season in their home base of Miami and also continue to amaze us with brilliant recordings. I highly recommend this CD/itunes recording! Awhile back I was contacted by Adam Beeken, the fine director of choirs at Lexington (KY) Catholic High School. Adam studied at the University of Kentucky under Jeff Johnson, one of the finest choral programs around. So I knew the choirs at his school would be excellent. Adam envisioned commissioning a piece for the school choir tour to Chicago in March 2013 and with a theme connecting music with visual art in some way. He approached me about this and I was intrigued, and we proceeded to hash out some of the possible ways to write a new piece with this premise. While Adam started fleshing out the rest of his program, I decided that I could perhaps create a sort of choral version of Mussorgsky's Pictures at an Exhibition. Thus, I would have to make the piece about a few visuals strung together, thus probably a multi-movement piece. I decided that since the choir was coming here to Chicago to sing, that I should make a trip down to our world-class art museum, the Art Institute, and see if there might be paintings that would inspire me musically and in my selection of texts. Since the school is Catholic, I also decided that my destination at the Art Institute should be the fine European Medieval through Renaissance collection of mostly Christian sacred subjects. If I could make a connection between paintings in the Art institute and the texts I chose to set, I would hope that the choir would want to visit the Art institute during their trip to Chicago to see, firsthand, the paintings that inspired their commissioned piece. Meanwhile some text selection/musical ideas were already beginning to percolate. Not long ago the great conductor Bill Dehning suggested to me that he felt the Williametta Spencer setting of John Donne's poem “At the Round Earth's Imagined Corners” was a fine piece, but really seemed to hastily get from line one of the sonnet to the end. Bill is right, the piece is over in a blink of an eye, usually clocking in at about two minutes. 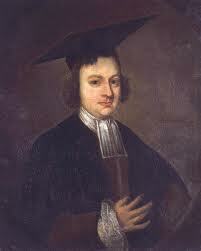 In addition to the Donne and possibly considering texts by Thomas Merton, I had also been sifting through the bizarre English poet Christopher Smart's oddly fragmented Jubilate Agno (Rejoice in the Lamb) for text shards of interest. You may recall that this is the text source for Benjamin Britten's masterful “Rejoice in the Lamb”. One text fragment which mentions Adam and Eve as well as the crucifixion had interested me. So here were two text ideas, the Donne and the Smart, that were now rolling around in my head. So as I visited the Art Institute, with no time restriction on my wandering that day a few months ago, I wanted to keep a very open mind about what really hit me visually and/or emotionally, while also an eye out for paintings that might mesh with those two texts (of course I was still also considering other text candidates as well). Would I stumble upon some serendipitous meeting of text, painting, and possible musical setting? It was an experiment which I thoroughly enjoyed as I wandered about. I had no idea if anything would come of this experiment. I decided to start with the oldest Christian art there. 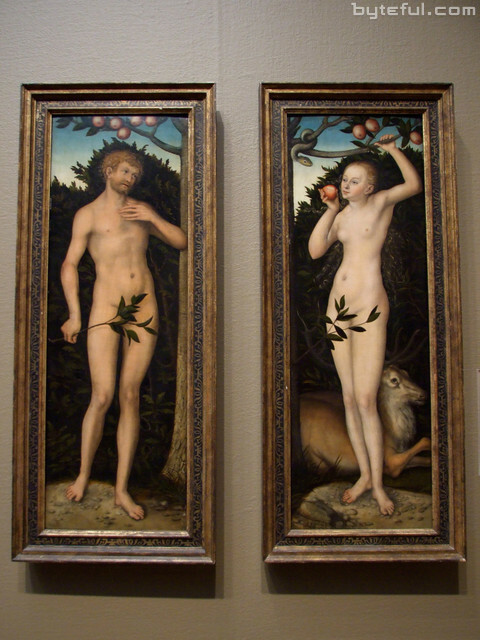 And before long I stumbled upon a painting, an “Adam and Eve” by Lucas Cranach the Elder from 1533/37 I had seen in earlier visits over the years. What strikes one about this two panel painting is its rather medieval flatness, the influence of Albrecht Dürer, and the slightly plaintive expressions on the faces of Adam and Eve, and I felt these expressions perfectly fit Smart's mixture of knowledge of Paradise, but also the Fall. The setting utilizes strange harmonies at times, generally minor modes, odd half-step inflections, yet also a major key momentarily ecstatic portrayal regarding the words about Paradise. Musically it draws more from Howells than Britten, and, by the way, I don't apologize for mentioning my English composer muses (which also at times includes other Brits such as Vaughn Williams and Holst). So I had stumbled upon an expressive, yet somewhat quiet painting and a text with generally the same attributes. Adam had wanted this piece to be appropriate for a large choir, which to me also implies that the piece needs to be ”big” at times, and perhaps also needs to finish “big”. 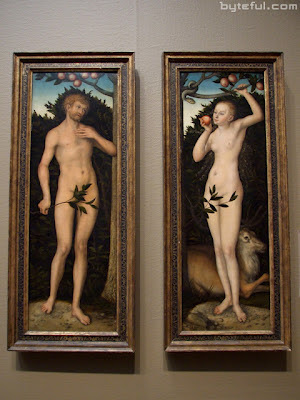 Obviously the theme of Smart's text and this simple Adam and Eve painting would not support the full requirements of the piece, and therefore it did become clearer to me that I indeed needed to write a multi-movement piece. Thus the Smart/Adam and Eve section could perhaps be a short first movement. Moving along in the Art Institute I came across an amazing Crucifixion by the Spanish painter Francisco Zurbarán. This large (11 ft by 7 ft) canvas is a powerful example of chiaroscuro - a bold black background, with the crucified Jesus in the center. This painting, when viewed in person, is both stunning and overwhelming in its single message. I realized that this was the Crucifixion spoken of briefly by Smart and wondered (over the next few hours and days) if I could perhaps take the message/image of this painting and mirror it by simply setting just the word “Crucifixus” over and over (the full Crucifixus text of the Nicene Creed would be implied). I realized that my setting could be quiet and meditative and/or crying with pain. The possibilities were there for something either intimate or more overtly powerful. As I mulled this over for a few days I decided indeed that I wanted to simply use this one word, focus intently on it, and yet I decided that I would not go over the top with some kind of overtly wounded, painful music. I would visit pain and suffering more subtly through use of some slightly unusual melodic intervals and also a chorale section with unusual harmonies (almost sounding like early Renaissance Spanish music) but keep this setting, for the most part, in the zone of intimacy- as if this would be the music in one's head during a “Stations of the Cross” arrival at station eleven. So, now I perhaps had two movements, linked to some extent by the Crucifixion theme, but also both probably introspective and not implying a “big” sound for the choir. In the same room as the Zurbarán was a large painting by Francesco Buoneri of the Final Judgment, the theme of the beginning of Donne's sonnet mentioned above. I realized I truly should set the Donne as the final section. After all, my developing story included major highlights of Christian history; Adam and Eve, the Crucifixion- why not arrive at the Final Judgment as a conclusion? I kept studying this painting but was having a hard time truly liking it. It just seemed a little underwhelming and even a bit mundane in its imagery. I wandered the whole building looking for something else along these lines, as I came to believe that a powerful setting of the Donne would not only round out a three movement piece but also give me a final section which would certainly be the “big” music I needed for the choir. But nothing else in the building visited the theme of Donne's text and I struggled for awhile with that disappointment. I contacted Adam and told him of my text ideas, the idea of a multi-movement piece, the paintings I had seen and so on. Adam was thrilled with my progress and we discussed whether or not this piece, now to be longer in duration than originally planned and contracted, would still fit his needs. He said it was fine with him and I gradually started setting the texts. So here was the final plan- the piece would start with the setting (about two and half minutes) of Smart's text (linked to the Cranach painting), a slight pause and continue (also about two and a half minutes) with the single word Crucifixus section (linked to the Zurbarán painting), and then proceed to a four minute setting of the Donne (with or without a painting twin), which would contain plenty of uptempo, loud sections. Thus the Donne is the destination and the piece takes that title. Musically the sections can perhaps stand apart, yet when sung from start to finish, there are elements that unite them, notably the early and mid-twentieth century English school melodic and harmonic influences mentioned earlier (the Donne section is very Holst- influenced, it might remind one of his Rig Veda music), a certain angularity to some of the melodies, but also conversely the importance of carefully chosen semi-tones in coloring melodies or turning harmonies in an unexpected direction. Adam wanted the piece to be challenging for his choir, yet still doable for high school voices. I paid close attention to ways to make this happen, and since the piece is SATB/piano, the piano allows for more adventurous music since it can help hold things together. The piece is very lyrical and I make sure that all voice parts take turns at singing melodies or leading in various ways. There is counterpoint of varying degrees as well, something missing in about 90% of the current cloying, homophonic American choral style. I also took care in writing for the men's voices- they go to divisi rarely and the ranges stay reasonable. All in all, I think I highly succeeded in this adventure that Adam sent me to explore! I am so thrilled that we have worked on this together and I am very excited to work with him and the choir as they prepare for the premiere of the piece and their trip to Chicago. As I was setting the Donne text I gradually realized that the real point of the sonnet is not the Final Judgment. I will plead guilty to being stupid for not noticing this much earlier, but the real theme is personal prayer, personal repentance, and a personal relationship with God. It's all right there in Donne's words, but I guess the epic drama of the Final Judgment imagery sure can get in the way. I now feel that the most important ideas are the very personal soul-searching lines which I set in an intensely lyrical, slow speed- not the uptempo Final Judgment lines. Thus I became aware that I should revisit the Art Institute and seek a different painting which reflects this new understanding of the Donne text. Well lo and behold, there is a painting literally a few feet away from the Zurbarán Crucifixus I admire and also that Final Judgment painting I didn't really care for that much. 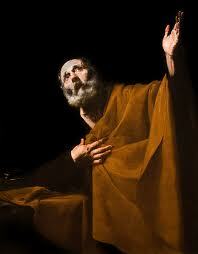 It's a painting by another Spanish artist, Jusepe de Ribera, of St. Peter intensely bemoaning his betrayal of Jesus. And while the story isn't one of the Final Judgment, it is one of deep personal searching, of great intensity, and of a personal dialogue with God about our own personal shortcomings and failures. The painting itself (probably influenced by a more famous El Greco version) is very powerful, the upturned face of Peter is anguished, yet it also seems to hold out hope for resolution with God. I realized that this painting truly fits the real message of the Donne poem. So, in conclusion, this project was unique, especially the steps I had to take to make all these elements relate to each other. And yet, can the composition succeed without these specific visual reference points? Yes, of course it can, but I still feel that telling the story of the project as Adam and I developed it, makes the final piece of music much more interesting, intense, and powerful. Et ascendit in cælum, sedet ad dexteram Patris). This past Spring I was contacted by Roger Dean/Lorenz, my main publishers, who told me that they had recommended me to Larry Doebler at Ithaca College to compose the commissioned work for the 34th annual Ithaca College Choral Festival to be held in November. I was quite happy with this news, and this is the first time a publisher actually produced a commission for me. Until now, almost all my commissions have come through the growth of personal relationships with people around the country, with the other few commissions the result of people who have sleuthed out my music and called me without first having a relationship (hey, any of these is fine!). I learned more about the impressive history of the Ithaca Festival and read up on the names of those composers who have already written the commissioned piece and was pretty humbled- names like Vincent Persichetti, Steven Stucky, Chen Yi, fellow Yale classmate Dan Asia, Dan Locklair, and others. I got to know Larry Doebler through e-mail, (what a nice man), and started looking for texts to set for this piece which was to be 4-6 minutes and for SATB a cappella or accompanied (my choice). At first I thought of doing a traditional Latin church text setting- the Persichetti commission was the first piece in the series- and as he set the Magnificat and Nunc Dimittus, I thought of reprising that, but then I decided I wanted to do something more modern as well as serious and substantive. So the poetry search now needed to be a thorough hunt for something truly special. I wouldn't just accept any old text, that was for sure. I felt it might take quite along time, but actually a poem I already knew just a little virtually leaped into my lap pleading for me to choose it- Amy Lowell's “September, 1918”, a war poem very different from other war poems as it is not about the battles themselves, but one civilian's reaction to the possible ending of war, whether an outbreak of peace could be trusted, and so on. I have always wondered about this- as WWI and WWII dragged on, how much did people wonder if the war would ever end? What would be the final toll both physically and psychologically on us all- how did we go from living in a fairly peaceful world, then to the mindset of being in the midst of world war, and then somehow back again to peace? This is something I have not experienced, yet this was reality for the generations of the first half of the twentieth century. 4. And the houses ran along them laughing out of square, open windows. 8. To put in a pasteboard box. 13. And note the crisp variety of its flights of leaves. 18. Upon a broken world. Examining the text, certain things become apparent- there is an excitement at the beginning-a description of beauty and action- of sunlight, water, tumbling, houses running(! ), laughing- a whole jumble of delirious actions and events. What reader encountering only these early lines in the poem would guess this is a poem that is, in some way, about war? And right here, the poem grabbed me- I am certainly very attracted to texts that work on multiple levels, that are open to multiple interpretations, that contain mystery and so on. Also at this point, the level of action attracted me, this proposed setting could have wonderful contrasts of tempo, something which appeals to me these days as I see so many US choral composers in the past twenty years writing everything at a ponderous, homophonic, soprano-dominant, 60-72 beats per minute. This text would provide ample opportunity for uptempo writing as well as more reflective moments. So the poetic study reveals some things which are pretty obvious- there is a dramatic shift with absolutely no warning as we go from line 8 to line 9. There it is, the whiplash inducing mention of war, and apparently a proclamation that there someday will be no war(?). But can we actually trust this statement of the poet- especially when we were ambushed by even the mention of war? Does she really convince us or even herself with this statement? Our answer comes from lines 10-13 and the subsequent information in 14-15 inform us that all these delightful images and actions in lines 1-8 truly were never trusted by the poet. They were noted but never truly enjoyed, they were put away for perhaps a future when it is okay to enjoy life. Lines 16-18 are the final sad thought and commentary- the happiness cannot be enjoyed because the poet can do nothing but try to survive, “to “balance myself on a broken world”. Even though in September 1918 it seemed as if the war was coming to an end, the world could certainly not be trusted. And so this poem which began with such positive, ecstatic images ends in distrust and sadness. The poem has traversed so many emotions and truly given us a kaleidoscopic tour of the mind of a citizen living in time of war. So here were the challenges ahead of me- how could I pull off representing all these emotions and how could I set that line 9, and those final sad thoughts to the best of my abilities. Big challenges, indeed. Here were some of my solutions (the piece is already almost done, far ahead of schedule, by the way). The opening lines are set to up-tempo music, a busy triplet theme in the piano intro sets up the busy-ness and this theme will come and go through the piece- it's the theme (almost solely in the piano) that represents the busy action parts of the poem. But to hint at something darker, there are already slightly strange dissonances in the piano and/or the voices in an otherwise major (or suspended 4th- no third) tonality. These odd, momentary dissonances are the slight clue that all is not happiness and bright and that things will change in this piece from light to dark. Btw, the vocal parts in this opening sound a bit like Randall Thompson or Vaughn Williams, a number of simple chords moving variously in parallel or contrary motion to each other. The music dies down and then the line 9 text arrives. Here there is a cross-relationship battle between major and minor chords, as well as conflicting major and minor scalar motion (somewhat like the odd scalar conflicts in Tallis). The men's voices intone the beginning of this in a repetitive dirge-like manner, and the women layer on top of this in long, ascending stretto lines. The setting of this line of poetry ends with the very loud, highly pitched culmination of this dirge and ascending stretto- I expect it to be pretty powerful when it is sung by the choir. The text of line 10-13 suggest a return to the feelings (and music?) of the opening. I do actually do this, but certainly not verbatim at all. At first the return is dreamlike- text from lines 10-13 fit the music of the beginning but the tempo starts slower, as if we were trying to recapture that opening feeling, but were having some difficulty doing so. Finally, the tempo does get back to the beginning tempo but before long we have arrived at the ending lines of poetry. There I use a device I have used in two earlier serious pieces- setting a text line or two in a chorale-like way, as if that text were perhaps the core, or the message, or moral of the entire poem. These chorales (often just a few bars long, especially in this piece) are usually in 4/4 time and may contain suspensions to draw attention to important words. It's as if the music has to become simple so that we hear the message from this Greek chorus. The line where this is the most obvious is line 16 “for I have time for nothing”, meaning literally no ability to appreciate anything of beauty. In this context, the statement is quite drastic. It means we virtually cannot endure war and its psychological destruction of the human spirit. The chorale weaves in and out as the poem and music end, and there is also a reference to a very simple melody which also has a very piquant harmony attached to it which was used way back in lines 7-9- about the innocent little boys. And then we finish in a choral unison of the last words “to balance myself upon a broken world”. I wrestled with how to set this ending quite a bit (and probably am still doing so, since I have plenty of time to tweak this piece). What does it mean if I set it chordally or if I set it in unison, what is the psychology of each? I am not sure I can totally put answers into English in response to this, but I kept coming back to the fact that a unison setting of the final words gives them more power- there is no distraction by choral harmonic sound, and there is also a unification of thought through the whole choir- hey are all delivering the message together. So I think this really is the best choice for the ending. Currently the piece clocks in at about six and a half minutes. I talked to Larry to make sure I hadn't overshot the commission length too much and he was fine with it. We'll see how my final tweaks affect the duration, and what other tweaks happen-- I'm always playing with choices in regard to the exact dynamics, tempi I am going to mark in a piece. I'm also constantly trying to figure out just how long final notes of phrases for singers (especially if they are a hard consonant) should be and whether they end on a strong or weak beat (yes, these tiny details of release points can make a difference to the sound and also the psychology of a setting). I'm very pleased with the piece so far and I hope that the audience is drawn into the drama and personal voice of this war poem set from the point of view of a civilian. 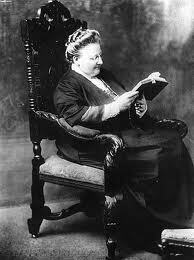 I think it is one of Amy Lowell's very best works. She is not a major poet but she certainly had her own voice, and it is still fresh enough to speak to us, unlike a number of other poets of her generation. P.S. The other two pieces where I have used the chorale idea are in a setting (for SATB and strings, one on a part or larger ensemble) which I titled “1944” from H.D. 's poem “Christmas, 1944” where I use the music from chorales in the J.S. Bach Christmas Oratorio to set some of the words, and also a piece called [HUSH] which is about divorce and young children surviving that situation (the divorce references in that poem are actually quite veiled). * "What can you do with it? It's like a lot of yaks jumping about". I recently was contacting Scott Tucker of Cornell to let him know I would be in the Ithaca, NY area this November (the Ithaca College Choral Festival has commissioned me for a work for their great fall festival) when I found out from Scott that he is leaving Cornell to succeed Norman Scribner as director of the Choral Arts Society in Washington. Wow- what an amazing appointment for Scott! I wish him much success. I especially love to hear that Scribner is handing over his group graciously and lovingly to Scott. Courtesy of Cornell University Glee Club - Scott Tucker will be the new music director of the Choral Arts Society. The Choral Arts Society has announced the successor to Norman Scribner, who is retiring as planned at the end of this season from the chorus he founded 46 years ago. And he’s not anyone most people in Washington have heard of. Scott Tucker, the choral director at Cornell University since 1995, is retiring from his tenured position leading the university’s choruses to take over from Scribner. “I was craving a new adventure, a new challenge,” said Tucker, 55, of his impending career change, which takes effect at the start of the 2012-13 season. Tucker was one of four finalists who came in this season to work with the 170 members of the amateur chorus after Scribner, now 76, announced his retirement in August 2010. The search for his successor became an international one, with about 80 applicants. Tucker applied cold, without any inside connections. The Choral Arts Society, founded in 1965, has long been a flagship chorus in a choral-oriented city. It has worked with generations of National Symphony Orchestra conductors and other leading artists, including Mstislav Rostropovich, Christoph Eschenbach and Valery Gergiev (with whom the chorus recorded Mahler’s 8th Symphony in London in 2008). In August and September, it will be touring Europe with Leonard Slatkin in performances and a recording of Berlioz’s Requiem. All four of Washington’s big symphonic choruses have experienced sea changes in recent years as their music directors approached retirement age. The Master Chorale of Washington shut down in 2009; two years earlier, the Washington Chorus ushered out its longtime director, Robert Shafer, and eventually hired the 40-something Julian Wachner. (Shafer promptly founded the City Choir of Washington, now in its fifth season.) The Cathedral Choral Society is seeing major staff changes this season, although J. Reilly Lewis remains at the musical helm. It seems to be true that if you hit it big, you can become a jerk (or maybe you always were one), and people will allow it. This even seems to hold true in the rather tiny world of composing within the tradition of classical music, where there is usually no real money to be made for 99% of those attempting in one way or another to make some kind of living. This post is my take on the Oswaldo Golijov musical plagiarism debacle, scandal, or tempest in a teapot, depending on who you want to agree with. The story starts somewhere- but that beginning is kind of murky. You almost have to sleuth this one backwards in time and use something called a brain to get it right for yourself. Mr. Golijov's simplistic explanation these days is not to be trusted- it's a fairy tale all about a melody and a few other strands of musical material he claims he and another person devised in the past and how it came to be used (over and over and over- hmm). 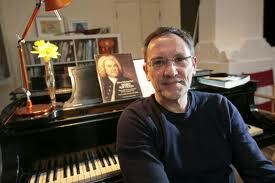 Oh, by the way, Mr. Golijov is an uncle to half of Milli Vanilli. The highly respected arts commentator Alex Ross and many others have weighed in on the subject, some defending Golijov's pastiche and “borrowing” (citing the long history of such in classical music) while others have gone for Goliyov's jugular. These folks point out that he's done this before, and in addition he's abused the musical world by being late on fulfilling commissions, submits works substantially shorter than the agreed upon commission length and other offenses. After a period during which he ignored the situation, Golijov finally offered up a pale explanation and pretty much no apology. In regard to his tardiness in fulfilling commissions his only response was “Composers shouldn’t be judged by being late,” he said, “but by being good.” Wow, tell that to an orchestra's artistic staff, music librarian, publicity department, and so on. They'd be thrilled to hear that, eh? I bring this all back up because current news reveals that a Golijov violin concerto promised for premiere in the Spring of 2011 and more recently scheduled for a performance in April 2012 has not been finished. The next scheduled performance of this phantom piece is set for Fall 2012. We'll see if it gets delivered in time for that and if it is just “Barbeich” and “Siderus” rearranged Pizzicato Polka style perhaps? In addition, more people are also discovering that the “Siderus” piece and its relationship to Barbeich” is actually preceded by a Golijov piece called “Radio” commissioned and paid for by a NYC group. So apparently this ”amazing” music is so important to the universe that it keeps appearing with different names, as a commission paid for over and over by countless foolish groups, etc. Or could there be a connection to the Mayan calender predicting the end of the world in December 2012? Will the celestial tones of Radio/Barbeich/Siderus reverberate around us all in the final moments of our existence? This, I believe, is why we should cut Golijov slack, my friends. He has been chosen by the universe to composer music for our end credits. New thought flash- why do the titles of all these pieces sound like the names of Cirque du Soleil shows? And actually, don't the pieces sound like Cirque music? One cool dude, composer David MacDonald, has actually put together a side by side comparison in real time of Siderus and Barbeich- oh my Lord, the pieces are in the same key and even the same exact tempo- amazing. One other thing I am amazed by- all of the many consortium commissioning orchestras are (at least publicly) just accepting this piece and not a single one has complained out loud or, to our knowledge, asked for their money back. Could it be they are too embarrassed to want to say anything for the record- to admit they were too stupid and musically uninformed to know this was all happening? It actually makes me grin to think that this piece (which no matter the controversy- is pretty lame and musically inconsequential) was in honor of Henry Fogel, who made a big mess managing the Chicago Symphony Orchestra here in Chicago after Georg Solti retired. We are just now getting back on track after dozens of years of decline. Thanks to Fogel's successor, Deborah Card, and Riccardo Muti we're putting the recent dreadful and dreary Henry Fogel/Daniel Barenboim days behind us. I’ve never particularly liked Golijov’s music or his compositional voice. It’s like someone spilled more dissonances on Manuel de Falla and mixed with B-level John Adams all while pretending to be Jon Brion or Howard Shore. But even then, I respected him. Ainadamar is a fantastic piece and should really go down as one of “the” operatic works of the next 50 years, despite what I think of it aesthetically or personally; technically, it works, and it's Golijov's voice, as best as I can tell. It's authentically his. I have lost any sort of respect for Golijov after this debacle, though, and I hate what this could do to corporate and citizen sponsors of new-music composers, at least for the short term. This also makes all composers (or further reinforces the notion, false or not) seem like thieves or unoriginal. We’re original insofar as our influences become confluences: Americans who speak English all speak slightly differently from each other, and it’s those voices different from our own that pique our interest the most. We’re original insofar as our own voice has been shaped and is mature and can offer a rich vocabulary beyond the constabulary of neutrality that inhabits the vast majority of musical spaces. And Golijov went on and inverted that and created an affront to something we aspire to. Especially since Sidereus - his (or “his”) piece in question - is actually noticeably different from his regular voice, and the piece itself - beyond the, ahem, extended Ward-Bergeman “quotation” - is too sparkling, too riddled with consonance, too jagged at transition points to really be Golijov’s, in the biggest sense of the word. This is not a stylistic shift or a new development - this is Golijov affecting an accent, and he was called out on it. Most troubling is the silence that emerged afterward. There were no discussions, publicly anyhow, among the consortium of orchestras that commissioned Sidereus to pull the performances or ask for a refund. Ward-Bergeman hasn't gone on record, and I question the ethics of that small-name composer if he was willing to part, for a price, with a piece of his, knowing he'd not receive continual credit or recognition, knowing he'd never be able to. But then, we have to consider the cover song in pop music. To some degree, one artist buys out another through licensing and freely takes on the role of reconstruction worker to remake the song in his or her own voice. It may be a model shift or a difference in culture, but in art music, the quotation is short and well-placed; a quotation isn't the complete work spun round with someone else's name on it. There is no culture of a "cover artist" in classical composition - the closest we come is in having different ensembles and performers, but it's practically unheard of for a composer to "cover" another composer. And I largely don't think the art-music culture will ever embrace that. Thanks to Tom for sharing his thoughts. And many composers who continually get passed over for good opportunities and commissions eventually tire of the situation and just quit composing, a really sad loss in my opinion. And I will say for myself, I hate Golijov's attitude about this- he has no respect for the performers or the organizations and makes all composers look like jerks. I resent having to being guilty by association because of him and others like him. I've never been late on a single commission and I have never rushed a piece just to finish one. We'll see how Golijov's world develops as hopefully, some people become wary of his behavior, but for now I just wanted to get my two cents worth in about how unfair this is to the many struggling composers out there who truly are trying to compose with a fresh, personal voice of their own. Oh, by the way, lately I've seen some composer contracts that actually state that the composer signing the contract must write the piece him or herself. This looks to be one obvious result of the Golijov debacle, I guess. It's fine with me, but kind of evidence that what he did is now held against the rest of us.